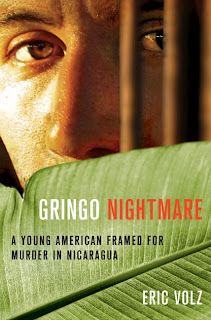 I haven't been able to read it yet, but Gringo Nightmare is the autobiographical story of Hillwood High School graduate Eric Volz and the whirlwind of events in Nicaragua following the tragic murder of his ex-girlfriend, Doris Jiménez. Volz will be at Davis-Kidd tonight at 7:00 p.m. to discuss and sign the book. This story made international headlines. The victim's mother, some of the Nicaraguan press and at least one of the Nicaraguan newspaper's online polls think Volz is guilty of the murder. Volz was convicted of the crime in a Nicaraguan trial court, spent time in jail on a lengthy sentence, and then was freed when the conviction was overturned. Volz made it out of the country, and now Nicaragua wants to re-try him in absentia. Volz's response to his critics is the Gringo Nightmare book, along with a companion web site featuring an evidentiary record replete with photography, audio, and video. Eric Volz was born in 1979 and arrived in Nashville at the age of thirteen, following his parents' separation and his father's moving here from California to be closer to the music business. Eric's mother was the daughter of Mexican immigrants, and she spoke Spanish to Eric at home, even though she grew up speaking English and identified with American culture. knowing her triggered my desire to connect with my own heritage, to understand the experience of my mother and her parents...now, with a new desire to know my roots, I began to learn to speak the Spanish language for the first time. Volz eventually moved to Nicaragua, settled in, and started a magazine. It was there that he met the woman whose murder is the subject of Gringo Nightmare. My review of the book will be posted here soon. Meanwhile, meet Volz at Davis-Kidd tonight, and catch up on old HispanicNashville.com stories about the dramatic story of Eric Volz.